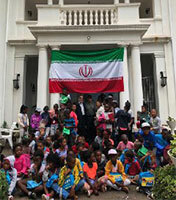 On Sunday 9 December, the annual program "Together with the children of South Africa" with the presence of his Excellency, Mr. Movahedi Ghomi, the Ambassador of Iran in Pretoria, the auspicious gathering with the children was held in Johannesburg. 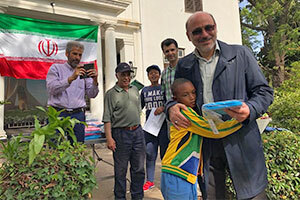 This annual event which takes place every December included the participation of the Iranian community with children of the same age as the more than 100 children orphans hosted from various orphanages within the Gauteng Province. The event took place at Iran House in Mountain View, Johannesburg with ECD trained counsellors. The event incorporated various games and entertainment such as a hand painting studio, a selfie photo-booth station with historical and cultural places of Iran as photo backdrops, and of course all the children enjoyed delicious Iranian cuisine in the late afternoon. The ceremony ended with a gifts and prize giving of Iranian treats given to the children. At this year's ceremony, the gathering of Iranian expatriates also showed appreciation to the few representatives of the South African community who also appreciated the Annual Day as a significant event. Ambassador Movahedi Ghomi further reiterated that the introduction of these cultural, sports and social programmes are possible and that it is within the Iranian Embassy's mandate to support and strengthen the development and diversity of such occurrences.